This entry was posted in Art, Mathematics and tagged Art, blue, geometrical art, mathematical art, semicircle, tessellation, yellow by RobertLovesPi. Bookmark the permalink. Can you share how you did that? It’s eye-boggling! Sure! 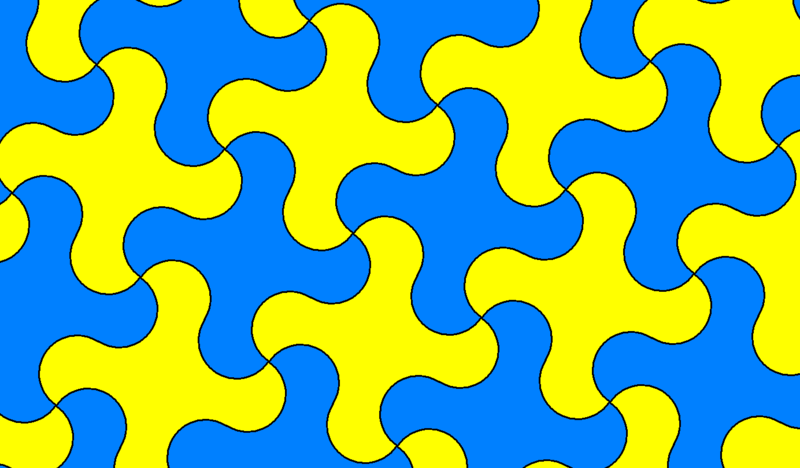 It’s a tessellation of squares made with Geometer’s Sketchpad, but with each square-side replaced by two semicircles, pointed in opposite directions. After making that with Sketchpad, I took a screenshot, then added the colors using MS-Paint. If you look me up on Facebook (see “Contacting RobertLovesPi”), you’ll see I have something similar as my cover photo there, but using triangles instead of squares for the tessellation. How clever! I haven’t heard of Geometer’s Sketchpad. Is it expensive? I paid a hundred bucks or so for it — roughly the same amount I paid for Stella 4d, the program I use to make all the spinning polyhedra on this blog. I don’t have the latest version of Sketchpad, though, but the version I have does just fine for what I need. You can find Sketchpad easily with a Google-search — it’s sold by Key Curriculum Press. As for Stella 4d, every post I make using it has a link to the website where you can try it (as a free trial download), and then purchase it if you like it. Thanks for the info. Not a bad price for as much as YOU use it! I think I’d use the Geometer Sketchpad more. Stella 4d seems intimidating. If I had to choose between one or the other, I’d go with Stella 4d — easily. That’s why you’re Dr. Pi and I am not. Now you’re embarrassing me! I know the person, an Australian, who wrote Stella 4d . . . and, believe me, he can run circles around me when it comes to anything mathematical. One advantage of Stella 4d: the trial download is free! You can give it a try for nothing! Here’s the trial-download link, in case you’re interested: http://www.software3d.com/Stella.php. Reblogged this on Wacks Formula – Math Shortcuts.